This text is similar to my contributions to the Encyclopedia of Caves and Karst Science and Essential Sources in Cave Science. 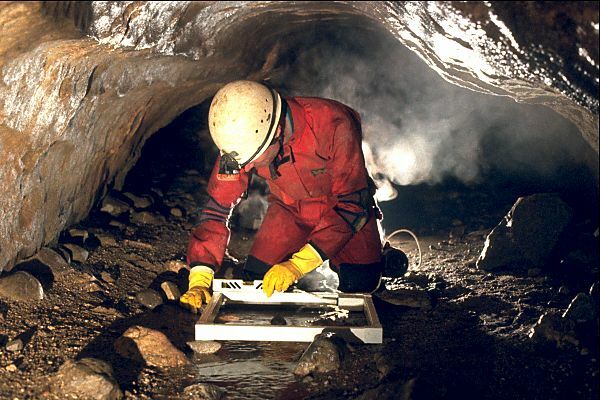 Radiolocation, in the speleological context, is the procedure of determining the position and depth of an underground radio transmitter beacon by making measurements on the surface using a radio receiver. The name is, perhaps, a misnomer because the underlying physical principle owes more to the phenomenon of magnetic induction than to "true" radio. Using radiolocation, an underground aven or choked inlet passage can be correlated with a surface feature quicker than by conventional cave surveying methods. Such fixes are useful, not only for exploration, but as an aid to cave communication using induction radios, which generally require the shortest possible communications path (see Communications in Caves). Rescue teams maintain maps showing the location of these surface and underground stations, thus allowing communications to be set up swiftly in the event of an incident. Radiolocation is also used to verify underground surveys - the point on the surface immediately above a survey station is radiolocated and its position measured by an accurate surface survey or GPS reading. Radiolocation in its present form dates from the mid-1950s when transistorised equipment started to become readily available to experimenters and the mid-1960s also saw a spate of research by the US Bureau of Mines. The method of radiolocation used by cavers has changed little since its inception. A transmitter antenna, consisting of many turns of wire on a loop of typically 500mm diameter, is placed horizontally underground with the aid of a spirit level (photograph 1). An amplifier drives the antenna with a very low frequency (VLF) signal causing it to generate an alternating magnetic field. Typically a power of 10W is used at 1-3kHz. At such low frequencies there is virtually no electromagnetic radiation - the power is dissipated as heat in the antenna. The magnetic field induces a signal in a receiver antenna, which is usually of similar construction to the transmitter. If the receiver loop is orientated such that no magnetic field lines pass though it then it will not detect any signal. Establishing this "null" orientation at several locations allows the operator to triangulate a "ground zero" point directly above the underground transmitter, at which location the field lines are vertical. (Figure 1). The method is described by Glover (1976) and France (2001). 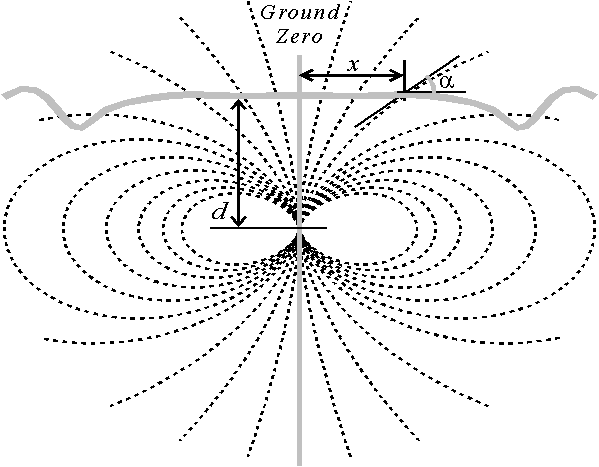 Below: Figure 1 The magnetic field lines from an underground transmitter form the familiar "bar magnet" pattern. Measurements of field angle (a) and distance from Ground Zero (x) on the surface allow the depth (d) to be calculated. The careful surveyor will take several readings at different distances, plot a graph, find a best-fit curve and thereby arrive at a good approximation to the depth. In practice, a couple of rough-and-ready approximations are adequate - for the field line at 45 degrees we have, x/d 0.562, so the depth is approximately twice the distance x and, for the field line at a =approx= 18.435 degrees, x/d = 1. The formula assumes that the field lines are in a "bar magnet" pattern. Obvious exceptions are if a magnetic ore body distorts the field or if the transmitter is tilted (Gibson, 1998). With a levelled antenna an experienced operator can achieve an accuracy for GZ of 1m for a 50m depth (2%) and a depth accuracy of perhaps 5%. With a 5 degree tilt, geometry dictates additional errors of 3%. If the surface terrain is uneven this must be taken into account or further errors will result. If the transmitter is grossly tilted then the technique described here will not work. However, the methods of radiolocation used by the mining industry do allow for this situation, where body-worn transmitters can allow prone or unconscious miners to be located. Derivations of depth from measurements on different bearings from GZ will sometimes differ markedly, especially if the transmitter is deeply buried, or if x >> d. If the transmitter is known to be level and if the presence of ore bodies can also be discounted then the likely cause is that the ground is anisotropic with respect to electrical conductivity - which is only to be expected for a bedded and jointed rock such as limestone. 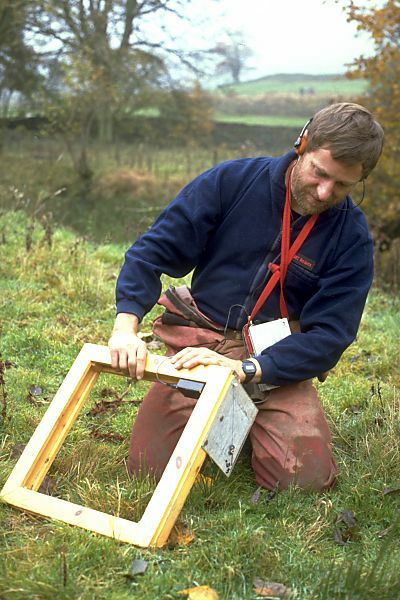 Indeed, an adaptation of this radiolocation technique can be used to measure the electrical conductivity of the ground by a non-contact means. The fact that the electrical conductivity of the rock can affect what is generally assumed to be a purely magnetic measurement is an important observation, demonstrating that magnetic induction is not the only phenomenon at work. It is the predominant effect only when the separation of the transmitter and receiver is much less than a "skin depth"; this being a figure of merit used to describe the extent to which electromagnetic waves penetrate into a conductor. If this condition cannot be met, the "secondary field" caused by induced currents becomes significant and prevents accurate measurement of a. Additionally, neither the depth equation nor the inverse-cube law hold true in these conditions. A useful GZ measurement is still possible, but depth determination is prone to errors of around 20% at two skin depths. It is for this reason that the accuracy of deep radiolocations must be called into question. Close to a transmitter, skin depth does not have the usual physical interpretation, but we nevertheless define it, formulaically, in the way familiar to geophysicists. In the presence of a water table or conducting overburden, skin depth can be very low. It may vary from under 10m (conductivity 0.01S/m, frequency 100kHz) to over 500m (0.001S/m, 1 kHz). Techniques for correcting the errors due to deep radiolocation are being developed (Pease, 1997). When radiolocation leads to new cave entrances being opened this may not always be for the best. In Dale Barn Cave, (East Kingsdale, Yorkshire) divers radiolocated an aven which was then excavated in an impressive engineering operation. This opening of the far reaches of a cave to non-divers - with the attendant question of cave conservation - is not unique. Several points in the far reaches of the Gaping Gill system (Yorkshire) are known to be very close to the surface but so far remain un-excavated. In Wales, radiolocation aided the opening of a "back door" entrance to Ogof Draenen to fierce arguments about the need to balance the needs of cave explorers and rescuers with the need for cave conservation (Lovett, 1999). With a new understanding of how magnetic fields propagate in rock, it is likely that location systems will develop further, becoming more widespread and easier to use. Although a useful aid to surveying, the need for conservation must be borne in mind. Below: Photo 1 Levelling a radiolocation transmitter loop prior to use. (Photo: © Mike Bedford). Below: Photo 2 Using a nulling technique to measure field angle - note the clinometer attached to the side of the receiver loop antenna. (Photo: © Mike Bedford). This article is copyright © David Gibson, 2002.